In the early 1980s, I used to love watching the Ripley’s Believe It or Not TV show with Jack Palance. There were and still are many Ripley’s Believe It or Not books, filled with all sorts of strange images, similar to these pictures on extreme human body parts. I also remember playing a Ripley’s Believe It or Not trivia game at the time, with the purpose being to tell whether or not what was stated on one of the cards was true or not. They also had questions like this on the TV show too. Ripley began publishing brief panel articles in The New York Globe in 1918 featuring odd news and facts from around the world. In 1929, the famous publisher, William Randolph Hearst, began running these panels in his papers (syndicating them in 17 papers worldwide), increasing their exposure and popularity. In the 1930s, Ripley expanded into radio, short films, and opened a museum. In 1936, he was voted by New York Times readers as the most popular man in America. As such, his endorsement was highly coveted by advertisers, including the tobacco industry. Below (click to enlarge) you will see what is actually an advertisement for Old Gold cigarettes (established in 1926) designed to look like one of the Ripley panels. Old Gold is a cigarette brand of Lorillard Tobacco Company. Note their common advertising phrase at the time “Not a Cough In a Carload” features in the ad. 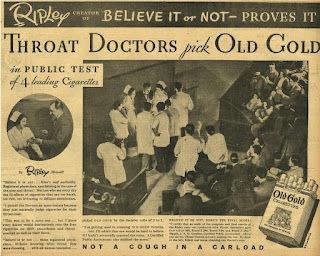 In the ad, the reader is informed about a “public test” of four cigarette brands in which Old Gold is reportedly chosen by otolaryngologists (ear, nose, and throat doctors or ENTs) as the best cigarette, leading to the eye catching headline. Note that not a single one of the doctors are identifiable in the ad. The person in the dark suit is Ripley. Using ENT’s was purposely designed to enhance the credibility of the sales pitch. After all, if cigarettes are believed to cause irritability to the nose and throat area, what better doctors to endorse a cigarette purporting not to cause such ill effects. Ripley claims to have run a blind experiment but unlike descriptions of true experiments, the reader is not told how many ENTs tried the cigarettes or what the cigarettes were that they were being compared against. The ad also claims that there was a “decisive ratio” of 2 to 1 in favor of Old Gold but the reader has no idea if this is truly significant from a statistical perspective. Old Gold received 50% of the votes, two other brands received 25%, and another brand received no votes. To illustrate how misleading these percentages can be, if there were only four ENTs, and two picked Old Gold and one picked two other brands, then 50% liked Old Gold and 25% liked one of the other brands. But if there were only four ENTs in the test, the numbers are misleadingly inflated. For those interested in learning more about how ENTs were used by the tobacco industry to cover up tobacco’s link to cancer, see this paper (the title says it all): The price paid: manipulation of otolaryngologists by the tobacco industry to obfuscate the emerging truth that smoking causes cancer. Believe it...or not.